Role Based Access Control (RBAC) is the new permissions model in Microsoft Exchange Server 2010. With RBAC, you don't need to modify and manage access control lists (ACLs), which was done in Exchange Server 2007. ACLs created several challenges in Exchange 2007, such as modifying ACLs without causing unintended consequences, maintaining ACL modifications through upgrades, and troubleshooting problems that occurred due to using ACLs in a nonstandard way. RBAC enables you to control, at both broad and granular levels, what administrators and end-users can do. RBAC also enables you to more closely align the roles you assign users and administrators to the actual roles they hold within your organization. In Exchange 2007, the server permissions model applied only to the administrators who managed the Exchange 2007 infrastructure. In Exchange 2010, RBAC now controls both the administrative tasks that can be performed and the extent to which users can now administer their own mailbox and distribution groups. If you want to change what roles are assigned to role groups, you need to change the role assignments that link the role groups to roles. Unless the assignments built into Exchange 2010 don't suit your needs, you won't have to change these assignments. For more information, see Understanding Management Role Assignments. Management role assignment policies associate end-user management roles to users. 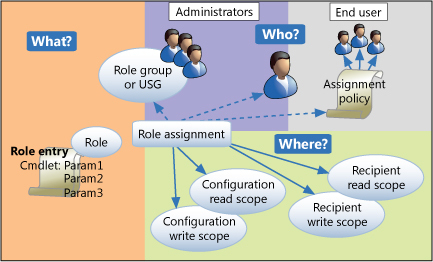 Role assignment policies consist of roles that control what a user can do with his or her mailbox or distribution groups. These roles don't allow management of features that aren't directly associated with the user. When you create a role assignment policy, you define everything a user can do with his or her mailbox. For example, a role assignment policy may allow a user to set the display name, set up voice mail, and configure Inbox rules. Another role assignment policy might allow a user to change the address, use text messaging, and set up distribution groups. Every user with an Exchange 2010 mailbox, including administrators, is given a role assignment policy by default. You can decide which role assignment policy should be assigned by default, choose what the default role assignment policy should include, override the default for certain mailboxes, or not assign role assignment policies by default at all. Management role assignment policy The management role assignment policy is a special object in Exchange 2010. Users are associated with the role assignment policy when their mailboxes are created or if you change the role assignment policy on a mailbox. This is also what you assign end-user management roles to. The combination of all the roles on a role assignment policy defines everything that the user can manage on his or her mailbox or distribution groups. If you want to change what roles are assigned to role assignment policies, you need to change the role assignments that link the role assignment policies to roles. Unless the assignments built into Exchange 2010 don't suit your needs, you won't have to change these assignments. For more information, see Understanding Management Role Assignments. In addition to the Recipient Management - Vancouver custom role group, Jane also needs a role assignment policy to manage her own mailbox's configuration settings. The organization administrators have decided that all users, except for senior management, receive the same permissions when they manage their own mailboxes. They can configure their voice mail, set up retention policies and change their address information. The default role assignment policy provided with Exchange 2010 now reflects these requirements. To give Jane the ability to manage her own mailbox settings, a role assignment policy needs to be configured with the required permissions. All end-user roles are removed from the default role assignment policy, except for: MyBaseOptions, MyContactInformation, MyVoicemail and MyRetentionPolicies. MyBaseOptions is included because this management role provides the basic user functionality in Microsoft Office Outlook Web App, such as Inbox rules, calendar configuration, and other tasks. For more information about customizing the default role assignment policy, see Change the Default Assignment Policy. As with Jane, Joe also needs permissions to manage his own mailbox. He is also given the same permissions as Jane: He can set up his voice mail and retention policies, and change his address information. For more information about adding a user to a role group, see Add Members to a Role Group.